The book is a "novel" construct, if I could pun on the word: seven distinct phases during Ferguson’s 25 years, each life repeating after the next as in 1.1, 1.2,1.3,1.4 and then onto the second phase of 2.1, 2.2, 2.3, 2.4 etc — I think you might have the hang of it by now. The problem for the reader is that keeping track of the divergent paths of each life is difficult and I had to keep notes of what happened in 1.1 so that I could pick up that particular life of Ferguson again in 2.1. Not all of the lives will make it to the final phase 7, and that speaks to Chance, Auster’s pet theme that occurs in many of his books, but all lives are tortured, because all four Fergusons aspired to be authors. 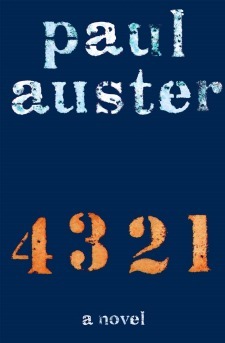 Only one of the lives may be attributed to the real Auster, or so we find out. The opening chapter 1.0 was by far the most interesting for me for it reveals the genesis of the Ferguson family, starting with our quartered hero’s grandfather, Reznikoff, who arrives at Ellis Island and is urged by a fellow émigré to change his name to Rockefeller lest he become an outcast; Grandpa forgets his new name when he faces the immigration official and says in Yiddish, Ikh hob fargessen (I’ve forgotten), and winds up being named Ichabod Ferguson—in one fell stroke of chance, a Russian Jew is converted to a Scottish Presbyterian. Welcome to America! The book covers the period starting at the end of WWII and ends around 1970 when the Vietnam War was tearing America apart. The early years show the birth of the post-WWII American Dream: courtship, marriage, economic growth, jobs, consumerism, the buying of houses, pregnancies, deaths, and scams - the stuff of middle class life during a boom. In the later years, we see the death of the American Dream as the young men of Ferguson’s age hover on the brink of being drafted into a war crafted by Nobodaddy (the term used for old men who send young men to war to achieve their own selfish ends). The only hope for those who can afford it is to continue their post-secondary education or damage parts of their anatomy so that they would be considered ineligible for the draft. Ferguson comes of age amidst the college protests in Columbia and Kent State, prison riots in Attica, the flower power of Woodstock, and the sexual revolution when sleeping around was de rigueur. The libidinous scenes are well done, including the homosexual ones. Sign into Goodreads to see if any of your friends have read 4 3 2 1. Sounds like a simultaneous Groundhog Day with no chance of redemption. John wrote: "Sounds like a simultaneous Groundhog Day with no chance of redemption." There's redemption for one out of the four - you have to guess who in the beginning. After awhile it becomes clearer.